The hyoid is a horseshoe shaped bone at the top of your throat, above the larynx, just below and behind the chin. It is suspended in a web of muscles known as the supra- and infra- hyoids. I call these muscles, along with longus colli, the belly of the throat, because they function similarly to the abdominals. Interestingly, the tongue is also attached to the hyoid. You can sometimes find the bone by slipping your fingers below the chin to the throat, a little wide, and feeling for the bone to move by sticking out your tongue. Don’t press too hard as this is a delicate part of the body. Many students struggle to find their head placement in a soft supported way. Awareness of the hyoid and the belly of the throat can assist spatial orientation of the head. What I see most often is a forward head posture with a collapse of the throat. It helps to soften the reach of the eyes and the senses, generally. From there, find the support through the lower body and then add a slight knitting of the belly in the throat as the hyoid draws slightly back. Review the baby sphinx study from the abdominals post. Coming onto your belly with your hands in line with your shoulders and ears, engage the base. Reach the toes and the tailbone back. Add a slight lift of the pelvic floor and the belly. Begin to yield and push through the hand and forearm. As the chest begins to lift, feel the soft knitting of the throat as the hyoid draws back. The head will lift just enough to clear the nose through center. As you release, turn the head to the other side, and rest. Once you have cultivated the feeling of the belly in the throat, try to feel it in different poses. Start with table. If you tend to hang your head low and round your shoulders, try drawing your hyoid back and see if that is enough to address the problem. In sitting or standing, start with the base. Use everything we’ve talked about so far to find support from below. End with a slight lift of the top rib – most of us collapse it – and then draw the hyoid back bringing the ears over the shoulders. Back off if this causes too much tension in the throat. It is not the same as tucking the chin. What about sideways poses like triangle and half moon? Begin with the head in neutral, nose lining up with breast bone, naval and pubic bone. Establish the front mid-line and lots of length from head to tail. Begin the turning of the head from the belly. Let the ribs respond. Continue the subtle spiral through the throat, the soft palate, and the head. 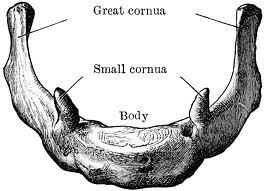 If it helps, consider turning through the horns (cornua in the diagram) of the hyoid. There is a ligament attaching the greater horns to the mastoid process behind the ear.